Safety Data Sheets (also known as Material Safety Data Sheets) are a common sight in workplaces across the country but some employees may still be unaware of what an SDS is and how it affects them. OSHA’s Hazard Communication Standard requires them to be made available to employees of businesses that work with or otherwise handle chemical products. The goal is to help employees protect themselves by understanding the risks associated with exposure to chemicals in their workplace. The manufacturer, importer or distributor of a chemical is responsible for providing the SDS for a product to the end user. An SDS is broken down into sections that give specific types of information about the product in order to allow the reader to easily locate the data they need. In an emergency an employee or first responder will skip to the section that contains the information pertinent to their situation, whether there is a fire or an employee injury due to overexposure. Some notable information in an SDS includes the product’s flashpoint, pH, optimum storage conditions, recommended PPE for safe handling and exposure limits. This information not only assists emergency responders like Protect Environmental, it also helps employers design controls and procedures that prevent accidents and contain spills when they do happen. Although OSHA adopted the Globally Harmonized System that sets a uniform format for Safety Data Sheets, some SDS may still exclude certain pieces of information that were unknown to the author at the time the SDS was published. Missing information can include but is not limited to the pH, transportation classification or waste disposal determinations. Since some common chemical products (e.g. Xylene or Sodium Hydroxide) have SDS published by more than one manufacturer or distributor, employers can most often find a copy that contains the information they are looking for. As an emergency response and remediation contractor, Protect Environmental frequently reviews Safety Data Sheets when responding to spills or handling and disposing of chemical wastes. We take safety seriously and use information to protect our employees, our clients and the environment. We also urge any business that uses chemical products to keep their SDS library up to date and periodically train their employees on how to use Safety Data Sheets. 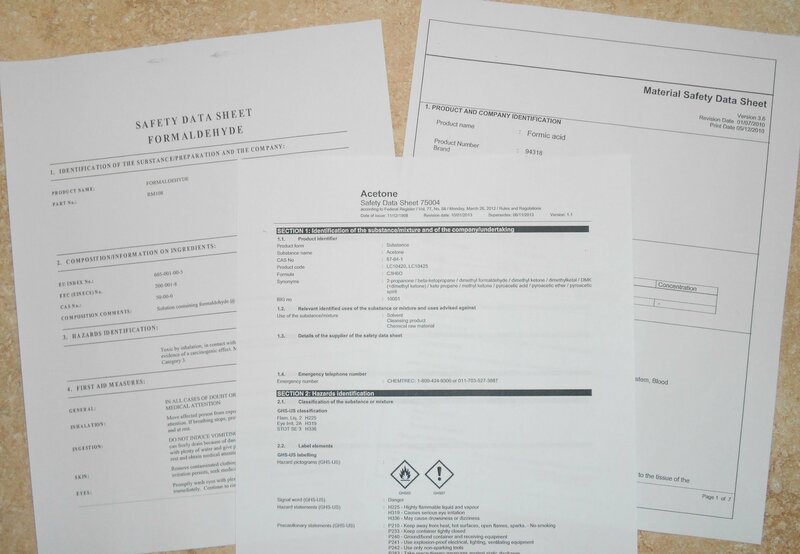 More information about Safety Data Sheets can be found on the OSHA website. To find out how you can make Protect Environmental a part of your company’s spill response planning; contact our office today.